My biggest complaint about MixPre and Zoom H4N is that they are both battery hogs. I’m sick and tired of getting interrupted midway though shoots because my Zoom or Mixpre batteries need to be changed. I priced several industry-standard NP battery distribution systems, and they just seemed way overpriced, and frankly more than I need. Would it be possible for me to build a bomb-proof power distribution system with a Tekkeon My PowerAll MP3450i battery and inexpensive parts? After about a week of ordering parts and teaching myself how to solder, I’m happy to say the answer is, definitively, yes. Including the cost of soldering iron and 3rd hand soldering clamp, I was able to build a power distribution system that will power my audio bag all day and then some, for $205.00. Here’s what it looks like, and how to make it. The Tekkeon has two DC outputs: one is a variable voltage cable that supplies between 5 and 19 volts (set via a dip switch on the battery). The other is a USB out that provides 5 volts no matter what the rest of the battery is set to. The Zoom requires 5 volts, so it’s the obvious choice. This was theoretically the simplest cable – I ordered this one only and it was supposed to come with everything to immediately connect up to the Zoom, but they shipped me a unit with a tip that wouldn’t work with the Zoom. I was able to splice the correct connector by cutting off the tip of the Tekkeon power cable that I also ordered (see below), and putting on the appropriate tip, which Tekkeon sells in this pack of connectors. Just splice and solder the red and black wires together, and ignore the white and green usb data wires. I didn’t want to perform surgery on the Tekkeon power cable that came with the unit, because I sometimes want to power my LED light with it. So I ordered one of the fine right-angle connectors from Tekkeon, which present a lower profile in the audio bag when plugged in. I cut the tip off it (which I put to work as outlined above), and got ready for the most challenging scene in this DIY drama: mating with the Hirose 4-pin male connector required by the MixPre. First, you have to uncouple the Hirose connector, and remove the 4-pin connector that you must solder to. It unscrews from inside the main unit – I used a pair of needle nose pliers to get it turning, and then it came out by hand. Others recommend plugging it into your MixPre, which gives you a better grip to unscrew from. 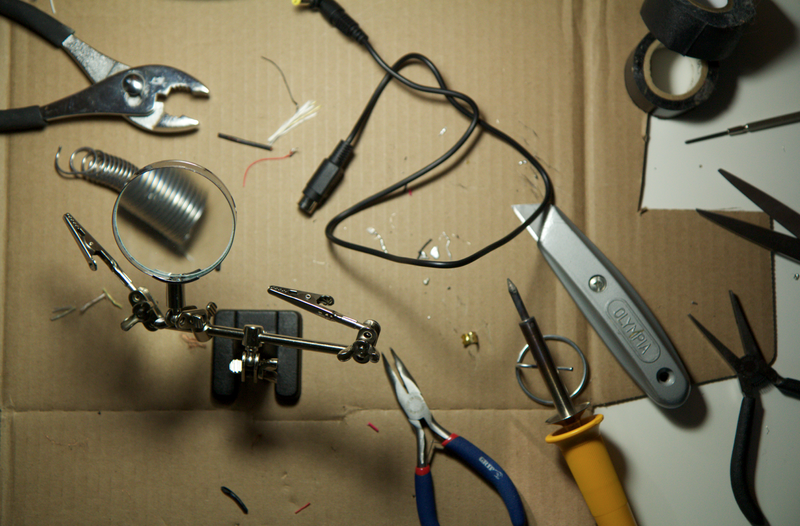 Here’s a picture that shows the Hirose broken down into it’s component parts, ready for soldering. Soldering the Hirose 4-pin connector is not a trivial undertaking. The pins are very tiny, and my hands are the opposite of nimble. So a third hand device was mandatory for me, which I found for about $10 on Amazon, including a magnifying glass for extra credit. The magnifying glass turned out to be mostly useless, but the alligator clips were essential to holding everything in place during my many soldering attempts. The trick: pre-tin the cups and the wires, so that things bond quickly as soon as they’re hot. But first, which wires go where? Knowing that the MixPre will simply ignore power that is the wrong polarity, I set about soldering different combinations until I found the right one. It took me 5 tries before I found the winning combo: #4 pin to positive (red), and both white AND black get soldered to the #1 pin. As I was grinding my way through the ordeal, some solder dripped onto the #2 pin while I was soldering the two cables to #1 pin, connecting the #2 and #1 pins with the both the black and white wires. So bit of a cluster there. Anyway, it works. (I think the #2 pin is ignored in this wiring scenario). Oh, there’s one more thing. Once I had everything soldered up correctly, I realized I’d forgotten to slide the rubber jacket and screw-in body of the Hirose connector onto the cable BEFORE I started soldering. Which of course meant I had to redo everything. Don’t do that. There’s some discussion in the forms about what voltage is ideal to set the battery to provide to the MixPre, which will accept anything from 5-18 volts. I chose 9 volts and it works great. The lights are much brighter on the MixPre when it’s powered this way, and it seems to power mics a bit hotter with 9 volts than it does with the internal AA batteries. As a bonus, I discovered that both the Zoom and MixPre fail over to internal batteries automatically without interruption if the Tekkeon is accidentally switched off, runs out of battery, or if their cables come loose. Sweet. Thanks to following websites for help: TaperJ on Tappersection.com has great advice on wiring Hirose connectors. Also thanks to instructables.com for advice on how to solder wire correctly. 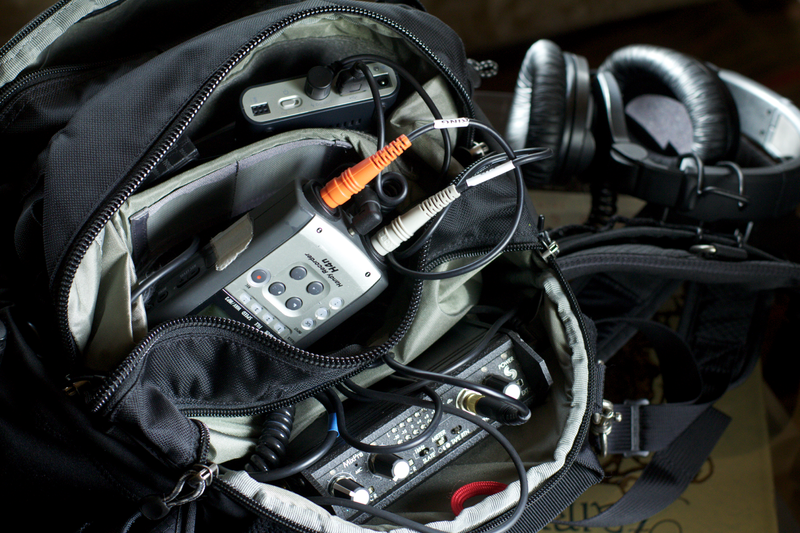 This entry was posted in Sound Bag on September 29, 2011 by Dan McComb. Yeah, the battery has to be on for it to work! Wow. What a cool project. I’m about to purchase the MixPreD, H4N, some other gear, and was looking at the prospect of carrying a Santa’s bag full of Eneloops on every shoot. This Tekkeon battery project would certainly streamline the workflow. 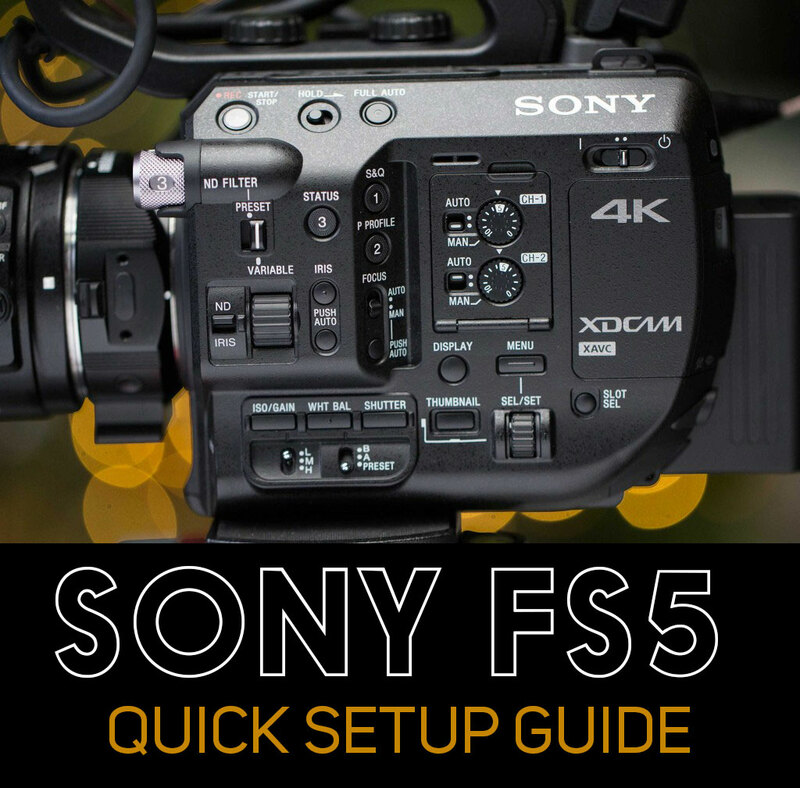 The shoulder rig is for single-operator run’n gun configuration. Given that I began as an audio producer, I like the idea of the MixPre-D on my shoulder rig in front of me where I can keep an eye on audio levels (assuming the H4N has been gain staged to accurately reflect the VU activity on the MixPre-D). I also like the notion of having the H4N on the front of the rig, flat and facing the talent so as to take advantage of it’s onboard stereo mics for ambient recording. I believe record/playback mode can be initiated with a remote switch. Directly adjacent to the MixPre-D would be a Marshall 5″ video monitor taking a feed from a 5D Mark II. 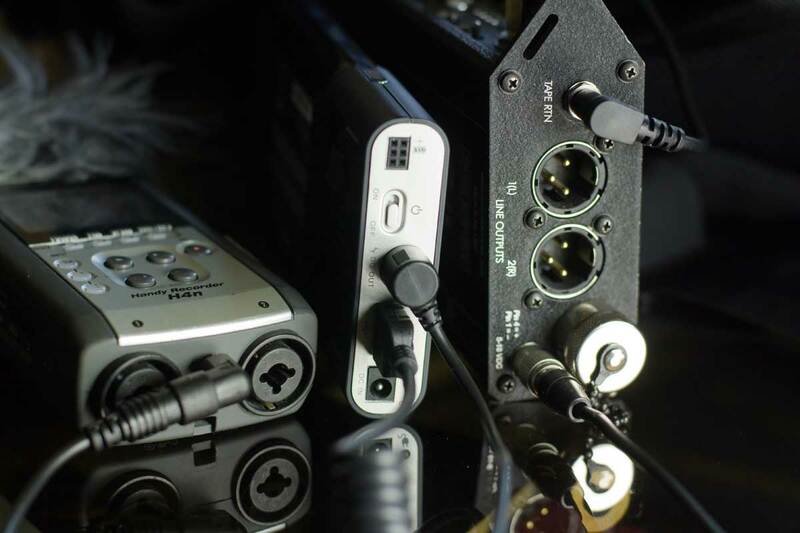 I’m wondering how feasible it would be to purchase or fabricate a Y-cord/splitter for the 5V cord exiting the Tekkeon such that both the H4N AND the Marshall 5″ monitor could be powered by that feed. The Marshall monitor uses four AA batteries but can also be powered by a 5V DC adapter/wall wart. It consumes 1.25 amps for a total of 6 watts. 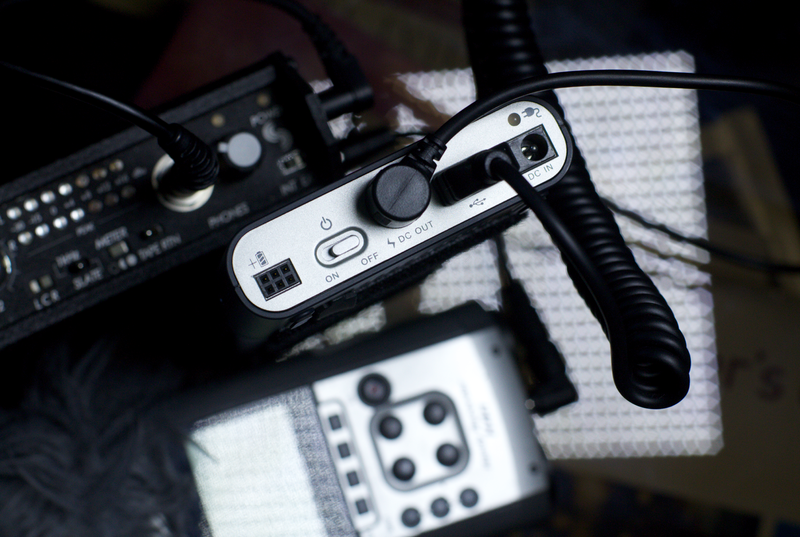 The Zoom H4N is a 1-amp device at 5V = 5 Watts. If I understand this all correctly, the 5V lead from the Tekkeon should require an 11W draw to power the Marshall monitor & Zoom H4N. Curiously the tech specs for the MixPreD don’t really define power consumption other than acceptable voltage. Perhaps it depends on if and how phantom power is used, etc. The spex indicate that the MixPreD can be powered by an external DC source from 10-17V. Dan is running his unit at 9V and it appears to be running just fine. I’m curious if there is a reason you chose to run it at 9V instead of 10V. If 9V works well, that would be my preference also because I am again wondering if I can buy or fabricate a splitter cable to power two wireless receivers which are rated for 500mA at 9V or 4.5W each for a total of 9W. So he H4N, the Marshall 5″ Monitor and the two wireless receivers would require a total of 20W. I can’t imagine the MixPre would use a whole lotta juice. It does after all, run on two AA batteries. Assuming I’m able to fabricate the cords, does this seem feasible? With a 58 watt-hour rating for the Tekkeon MP3450i, is it safe to assume that this whole setup could run for two plus hours or so? I assume twice that time if the Tekkeon expansion battery is added? Great idea. I don’t see why you couldn’t split out the power as you describe, although I’ve never tried anything like that myself. There’s probably some kind of part you can buy at Radio Shack that would create a junction with two outs, or a Y connector that you could solder in to make it easier. I’ve tested my MixPre across the whole range of voltage that it accepts, and they all work fine (although the operating lights get MUCH brighter when you up the voltage, which is kind of freaky). Regarding run time, I’m sure you’d get at least two hours out of this setup. I get 30 minutes of runtime from this battery on my 14.5 watt CN900 LED light on full power, and an additional 45 minutes after that on half power. And that’s a serious video light. I can’t imagine the monitor draws anything close to that. I’d love to hear how this turns out for you – post an update here when you’ve got it finished! 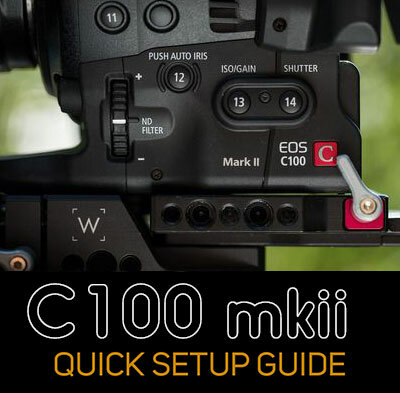 Which tip fits the Zoom h4n? Thank you! I just tried them until one fit. I think it has a yellow band around it, if that helps (unfortunately my kit is in use by a member of my team right now so I can’t look at it). @Dan. Thx. I’ve got the tip set, but none fit so I was wondering. There’s a letter and sometimes a number to identify which is which on them. Please keep me posted when you figure it out. Thank you. Hi Oliver, actually, now that I think about it, I remember I had the same problem when I first got the kit. I thought it was a mistake that they forgot to include the correct size for the battery, but maybe it doesn’t come with it. I ended up ordering this kit to get the correct part: http://www.tekkeon.com/productcart/pc/viewPrd.asp?idcategory=20&idproduct=125. I’ll take a closer look at the tip I have and see if I can find a part number for you when I get my sound bag back, later today. I like this sollution. My question is, how long (hours) can you operate with this setup? I haven’t measured exactly, but with this setup, I charge the battery once for every 4 or 5 full shoots. I’ve only had it run out on me once. Oddly, when that happened, the charge indicator was showing about 1/3 of full charge. So I’ve learned that it’s best to re-charge the battery when the LED lights are down to 1/2 to be safe. Hi there. I know this post is somewhat old, but I’m looking for a solution to powering a zoom h4n and an SD302 and I found yours. After all this time, could you tell me approximately how long does the battery last? Thanks! I haven’t actually tested it out by running it with a stopwatch. The longest I’ve had ours run during a real work situation was about 6 hours non-stop use. It was going strong and showed about 1/2 battery life at that point. However, from attempting to use this battery on Day 2 of a shoot without charging it overnight, I’ve discovered that you always want to charge the battery after every use – because while it may show 1/2 battery, it can suddenly reach the end of its charge without warning, while displaying more battery life than is actually left. My non-scientific answer is that it will last a normal day of shooting, because I’ve never had it run dry on me on the first day after a charge. Great idea. I came across this post because I am looking at doing the same. I live in Australia and the components are harder to come by. I cannot source the Tekkeon battery supply so I have opted to go for a cheaper but more readily available USB battery pack which can supply 2 x USB 5v outputs (2A and 1A). Have you tested the MixPre on 5v (using the USB output)? Great question – I’ll give it a shot tomorrow and let you know. Seems it should work fine – it’s within the limits published by SD. I can confirm this works. Just received a Hirose connector and have made a small USB to Hirose lead and it powers just fine from an iPad USB charger. 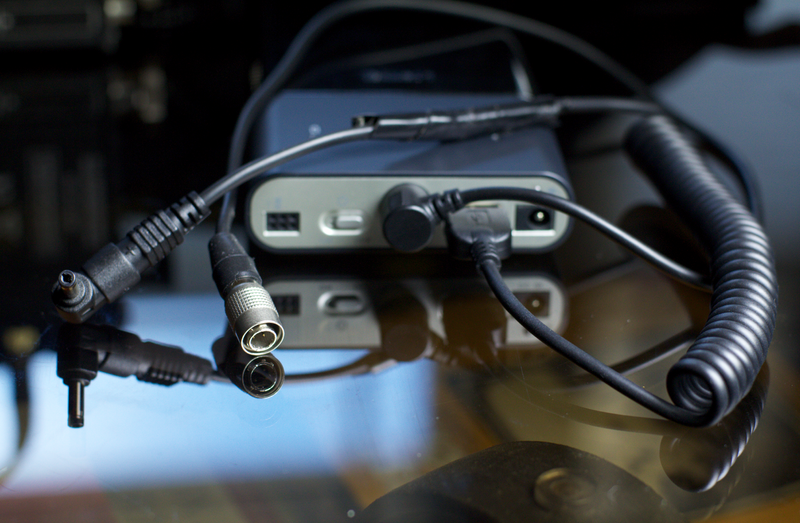 Also made a USB to H4n power lead and that powers again perfectly. Having both now powered from USB power makes it a nice flexible option as it’s much easier to switch between battery and AC power. I am also putting together a simple converter which allows a 12v source to power the rig via a USB cigarette plug so I can use either vehicle power or a 12v 7AH portable battery. This wouldn’t be great for carrying around BUT for what I do (SFX gathering) it makes it a good option for setting up for long periods out in nature and when camping etc. Sweet, that is great news. Thanks for the update. Sounds like a killer rig you’ve got there. I’m just getting that and the Tekkeon cable you suggested and splice the cables together. Seems a bit easier that fiddling with the soldering of the Hirose connector. Hi Dave, thanks for that tip. If I’d have been aware of that, I’d have saved myself a lot of hassle and done the same thing! This is regarding the the Tekkeon power cable. This is a “3 core power cable” right? The reason im asking this is because “Tekkeon” doesn’t ship to india so i thought of getting this cable from a local hardware store. (Or) can i use a 2 core power cable to solder to hirose 4 pin?